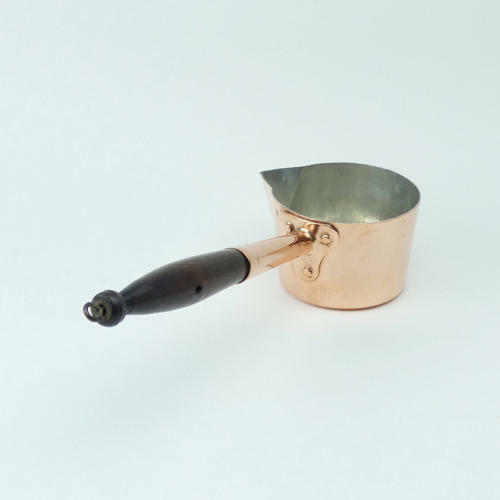 A 19th century, French copper saucepan with a pouring spout and a wooden handle. This piece has a pointed spout and it is ideal for small quantities of sauce or for heating milk. It is well made, from a heavy gauge of copper. It has an attractive copper fitting and a simple, dark wood, turned handle. It dates from c.1880 and to the side it is marked with a number '10' which relates to the size. It is in excellent condition and the interior has been re-tinned so that it is safe to be used.